There may be changes to the original itinerary for the September Bus Ride, because fresh historic sites might by then be available, but the trip will include the Zion Graveyard (opened in 1805) along with other buildings from different periods of Attercliffe history. Are these trams going anywhere? The announcement that the new Tram-Train service between Sheffield Cathedral and Rotherham Parkgate would begin service on Thursday October 25th 2019 was not before time. It was initially planned to open in 2015, and the seven new Tram-Train vehicles have been running on the main Stagecoach Supertram network since September 2017. The South Yorkshire Supertram network now runs two separate fleets, the original German-built Siemens-Düwag units of 1992 (numbers 101-125) and the seven new Spanish-built Vossloh vehicles (number 201-207). Even before the new service started up, the South Yorkshire Passenger Transport Executive (SYPTE) initiated a consultation exercise to determine the future of the system from 2024, when the Stagecoach franchise expires: https://www.travelsouthyorkshire.com/futuretram. It seems that no provision has been made to finance the replacement of the original fleet, which is nearing the end of its useful life. The consultation includes the suggestion of scrapping the whole system, which understandably has few political friends outside Sheffield: https://www.doncasterfreepress.co.uk/news/mayor-ros-jones-no-more-cash-from-doncaster-taxpayers-for-supertram-1-9344722. This has, predictably, greatly exercised the tram-enthusiast community – [http://www.britishtramsonline.co.uk/news/?p=24061] – and provoked South Yorkshire taxpayers (such as me) to query whether their community charge and taxes are being wisely spent. I wonder if this option among a range of others is actually political shroud-waving. It’s not simply a matter of scrapping the vehicles and covering the tracks with tarmac, as happened to Sheffield’s first tram-system in the 1950s. Not only has most of the track been relaid over the past few years, but dismantling Supertram would involve demolishing viaducts and reconfiguring road junctions and traffic signals across an eighteen-mile network. It would also fly in the face of applying the results of the Tram-Train pilot scheme to other parts of South Yorkshire as well as the rest of the UK. As a Sheffield resident I’ve often wondered why the South Yorkshire Supertram system has not developed, apart from Tram-Train, since it opened a quarter of a century ago. In that time the Manchester tram-system has extended from two former rail routes with a street link into Piccadilly Station to seven routes (with an eighth, to Trafford Park, under construction) and the original 26 trams have been replaced by a fleet of 120 trams with 27 more on order. 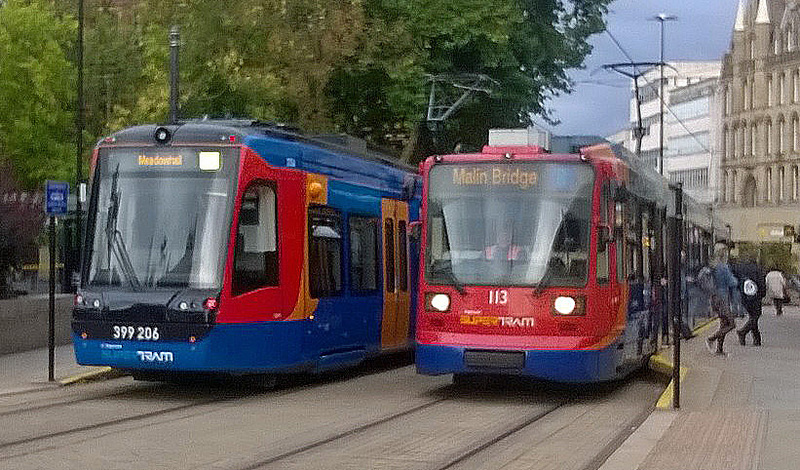 In Nottingham, an initial service to the north of the city has grown to an X-shaped system running 37 trams over twenty miles of track, and the Birmingham tram-line to Wolverhampton, which initially stopped short of the city-centre, is now extending across the city with the intention of reaching Edgbaston by 2021. In Edinburgh, where the tribulations of construction caused uproar, the tram service is hugely popular and likely to be extended in the next few years. Why is there talk – even hypothetically – of shutting down Supertram when other cities are reaping the benefits of light rail? Update: The first day of service for TramTrain didn’t go well: https://www.thestar.co.uk/news/sheffield-tram-train-derails-after-collision-with-lorry-causing-major-travel-disruption-1-9414192. This entry was posted in Sheffield's Heritage, Transports of Delight on October 24, 2018 by Mike Higginbottom. Last week I received a letter from the Church Commissioners (because I’d made a formal objection to the demolition in 2013) notifying me that St Cecilia’s has at last been closed and the daughter-church of St Bernard of Clairvaux is the parish church with effect from August 16th 2018. St Bernard’s was completed, using recycled bricks from the demolished mansion at Clumber Park, Nottinghamshire, in 1954 as one of two mission churches in the vast Parson Cross parish. The other church, Christ the King, Deerlands Avenue, was consecrated on the afternoon of the first Sheffield Blitz, December 12th 1940. It closed in 1970 and was sold: it became a Roman Catholic social club, St Patrick’s, and is now a showroom. The notice of closure indicates that St Cecilia’s “shall be appropriate to use for residential purposes and for purposes ancillary thereto”, and “the contents of the old church building shall be disposed of as the Bishop shall direct”, in line with the Draft Pastoral Scheme about which I posted an article in 2016. It’s probably the best possible outcome. It saves the residents of Chaucer Close from the noise and mess of a brick-by-brick demolition. It preserves an unobtrusive but attractive building on a housing estate that has few landmarks, having lost an outstanding but unlisted cinema in 2013. I’ll be interested to see how this wide building, with a nave and two aisles, adapts to housing. This entry was posted in Sacred Places, Sheffield's Heritage on August 30, 2018 by Mike Higginbottom. The most substantial remnant of Sheffield’s first-generation tram system is the original depot at Weedon Street, Tinsley, built in 1874 for the Sheffield Tramways Company when it opened its first horse-drawn line. This very early tramway was founded by the railway contractor Thomas Lightfoot, who also built the Douglas horse-tramway that opened in 1876 and still operates in the Isle of Man. Tinsley Tram Sheds is possibly the oldest remaining purpose-built tram depot in the UK. When the Sheffield Corporation took over the horse-tram company, its first electric trams, inaugurated in 1899, ran between Weedon Street and Nether Edge, with a depot at each end, and for the first few years vehicles were maintained and eventually built at the two depots – mechanical parts at Tinsley, bodywork at Nether Edge – until a purpose-built works at Queen’s Road opened in 1905. A well-made film of a tram-journey from Beauchief to Weedon Street in 1960 ends with Roberts car 523 disappearing into the tramsheds: https://www.youtube.com/watch?v=E0a28Q_78eM [at 16:45 minutes]. Almost all Sheffield’s trams, including the very last in service and those in the final closing procession in October 1960, ended up at Weedon Street, from where they were towed across the road to Thomas W Ward’s scrapyard. Sheffield people customarily referred to “tramsheds”, though all of them across the city were substantial brick buildings. Apart from Tinsley, they have either disappeared or survive only as sad facades. At one time Tinsley Tramsheds was home to Sheffield’s bus museum, until a schism led to one collection moving out to Aldwarke near Rotherham to become the South Yorkshire Bus Museum and the other, the South Yorkshire Transport Trust, eventually moving to Eastwood in a nearby part of Rotherham. Little remains of the tram-depot interior: the tracks, inspection pits and overhead gantries that gave exterior access to trams at upper-deck level have long gone. The whole of the spacious interior is currently occupied by a tile-depot. A glass-half-empty report from the Hallamshire Historic Buildings Society suggests that the building is deteriorating: http://hhbs.org.uk/2017/07/01/trams-to-tiles. Nevertheless, this Grade II-listed relic of transport history, located between the Meadowhall shopping centre and Sheffield’s new Ikea store, close to a retail park and the Sheffield Arena, could be smartened up by a savvy developer. Cracks in the tarmac of the forecourt show that the track-fan and stone setts survive, at least in part, waiting to be exposed. The interior is a flexible space with scope for adaptation, and the exterior is capable of restoration as one of the few historic sites remaining in the Lower Don Valley. This entry was posted in Exploring Attercliffe, Sheffield's Heritage, Transports of Delight, Victorian Architecture on May 17, 2018 by Mike Higginbottom. The Friends of Zion Graveyard have made great progress since their inauguration last May: they have secured funds and bought the land from the United Reformed Church, and have continued to clear the graves which had become buried in undergrowth. In the course of researching the Zion Congregational Church which stood on the site I’ve become fascinated by the history of the congregation, which stretches back almost continuously to the early history of Dissent in Sheffield. Attercliffe and Carbrook, two of the three villages in the Lower Don Valley, were centres of Puritan and later Dissenting activity from before the Civil War, when Hill Top Chapel was built as a chapel-of-ease to Sheffield Parish Church (now the Anglican Cathedral). There was a college for training Dissenting clergy at Attercliffe Old Hall in the late seventeenth-century, and informal congregations worshipped in several locations north of Sheffield during the eighteenth century. A temporary chapel was built on the site that became the Zion Sabbath School in 1793, and a permanent building was erected on the opposite side of what became Zion Lane in 1805. The existing Sabbath School building dates from 1854, and a fine Romanesque brick chapel with a tower and spire was opened in 1863. This building was demolished after a fire in June 1987. The 1863 chapel was founded on the energetic ministry of Rev John Calvert (1832-1922), who was invited to become minister in 1857. His leadership made Zion Church prominent, until its attendances exceeded any other place of worship in Attercliffe. Zion members helped to form branch churches in Brightside and Darnall, and a mission church at Baldwin Street, half a mile away. When Mr Calvert retired to Southport in 1895 he named his house ‘Attercliffe’. 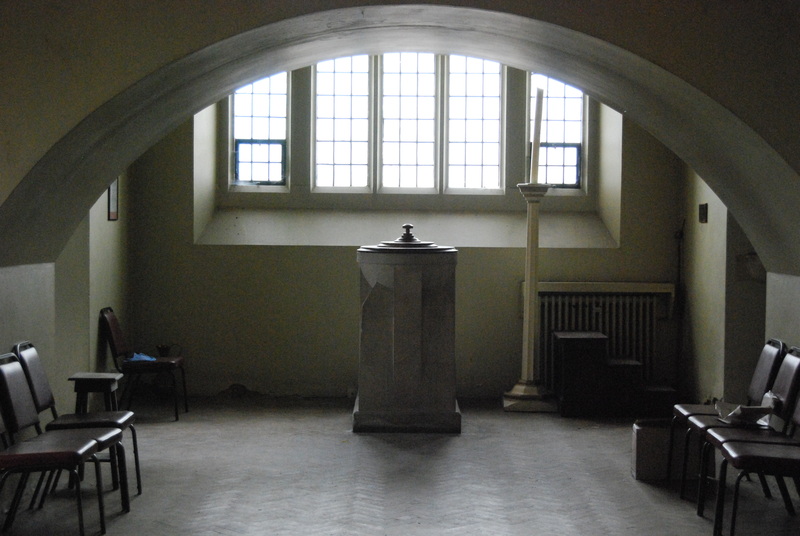 At the beginning of the twentieth century Zion was the largest Congregational community, measured by membership, in Sheffield: it had four hundred members when the four city-centre chapels had around three hundred each. To accommodate the Sunday School and young people’s activities, in 1911 the congregation opened an extensive Institute next to the chapel, designed by the Sheffield architects Hemsoll & Chapman, whose best surviving building is Cavendish Buildings on West Street. When first built, the Institute offered football, cricket, tennis, a gymnasium and a literary and debating section to young members of the congregation. This vigorous Christian community filled its extensive buildings for only twenty years. By 1930 the Sabbath School was leased as a printing works, and after the Second World War rooms in the Institute were leased to the Ministry of Works for use by civil-service departments. Gale-damage in 1962 made the church itself unusable, and services moved next door into the Institute. Zion Congregational Church closed entirely at the end of 1969 when the congregation amalgamated with Darnall Congregational Church. Photographic evidence shows that the Institute building was completely demolished by July 1977. The Church continued to be used as a furniture store until a serious fire on June 22nd 1987 led to its subsequent demolition. Now only the Sabbath School and the graveyard remain – unobtrusive monuments to a long, proud tradition of Nonconformist worship in north Sheffield. On Thursday May 24th the Friends of Zion Graveyard present Mike Higginbottom’s talk on Victorian Cemeteries at the Upper Wincobank Chapel, Sheffield. For further details, please click here. This entry was posted in Exploring Attercliffe, Sacred Places, Sheffield's Heritage, Victorian Architecture on April 3, 2018 by Mike Higginbottom. In the nineteenth century the rivers on which Sheffield is built were polluted, insanitary and smelly. The River Porter runs south-east to join the River Sheaf at the site of the city’s railway station, and the Sheaf then runs north-east for about a quarter of a mile to join the River Don at the site of the medieval castle. Both rivers were progressively culverted, tidied away and largely forgotten about. The original Midland Railway station, platforms 5-8 of the modern station, opened in 1870, and was more or less doubled in size in 1905 when the present concourse and platforms 1-4 were added. It’s difficult to imagine, while waiting for a train, that beneath the tracks is a spectacular complex of vaults and arches carrying the water from the two rivers northwards under Sheaf Street, where there is a brief open stretch before the watercourse disappears under the Ponds Forge International Sports Centre, next emerging at the confluence of the Sheaf and Don at the end of the oddly-named Blonk Street (named after a scissor-smith, Benjamin Blonk). This last section was only completed in 1916, after the demolition of the Alexandra Theatre a couple of years earlier. Part of the theatre building stood on iron columns over the river bed: http://www.arthurlloyd.co.uk/SheffieldTheatres.htm#alex. The now-defunct and possibly haunted Alexandra Hotel stands on an adjacent site: https://sheffield.camra.org.uk/2013/11/alexandra-hotel. There are plans to remove the 1916 culvert as part of the forthcoming development of the former Castle Market site, and there are informal campaigns urging the opening of other stretches of Sheffield’s buried rivers. This recent press article, about a sinkhole revealing the River Sheaf beneath the car-park of the sports-shop Decathlon, includes a spectacular video of waterborne gymnastics beneath the station: https://www.thestar.co.uk/news/feature-bold-plans-to-uncover-sheffield-s-hidden-rivers-1-8421598. An artful slide-show that suggests the cavernous extent of the area beneath the station (named for reasons which escape me the Megatron) is at https://www.youtube.com/watch?v=7fmsG6svhYo. And three more pedestrian urban-explorer reports are at https://www.28dayslater.co.uk/threads/river-porter-culverts-sheffield-railway-station-april-2017.108056, https://www.youtube.com/watch?v=T13hCT2XBn4 and https://www.28dayslater.co.uk/threads/megatron-sheffield-june-and-july-2015.97955. Brighton opened its sewers to public tours half a century ago: https://www.southernwater.co.uk/brighton-sewer-tours. Perhaps Sheffield should open its subterranean rivers. This entry was posted in Sheffield's Heritage on March 22, 2018 by Mike Higginbottom. Few people have done as much to preserve the living legacy of Sheffield’s industrial crafts as Ken Hawley MBE (1927-2014). Born on the then new Manor Estate, Ken lived almost all his life in the north of the city, the son of a wire-goods manufacturer. 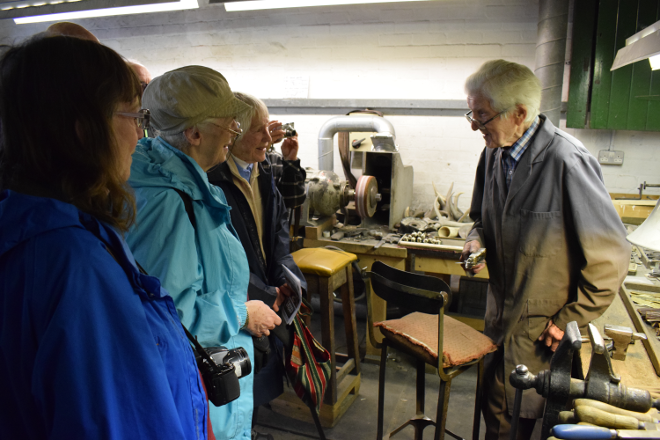 He left school at fourteen, in the middle of the Second World War, and after National Service he worked for a succession of Sheffield businesses until in 1959 he set up his own shop, selling “nowt but tools” for thirty years. Retirement in 1989 kept him busy for the rest of his life. On a sales visit to an undertaker in 1950 Ken was intrigued by an unusual brace which he was allowed to take home because it was no longer useful. From then on, often with the unanswerable words “You’ll not be wanting this, will you?”, Ken amassed a collection of tools, and tools that make tools, ancient and modern, across the entire range of Sheffield’s multifarious specialist crafts – saws, chisels, planes, hammers, trowels, spades, shovels, scythes, files, awls, shears, scissors, knives of all kinds, vices, drills, micrometers, callipers, soldering equipment, drawing equipment, kitchen equipment and surgical equipment that doesn’t bear thinking about. He was instrumental, as a member of the Sheffield Trades Historical Society, in restoring the historic Wortley Top Forge [http://www.topforge.co.uk], of which he was Custodian for forty years, but his greatest legacy is the collection of tools and associated archives that gradually filled his house, his garage and two garden sheds. Eventually, Sheffield University offered space for what became the Ken Hawley Collection Trust, which was relocated in 2007 to the Kelham Island Industrial Museum, where it formally opened in 2010. Here, as a separate operation from the Museum, a band of volunteers conserve, research and catalogue the seventy thousand or more artefacts and documents that form the collection. Ken was intensely proud of his city, “a wonderful place, with all the skills of the different people”, and considered it a privilege to bring together the evidence of its industry at the time when the traditional crafts were dying out. The Ken Hawley Collection can be viewed whenever the Museum is open, and its volunteers are more than happy to explain the intricacies of the specialist displays: http://www.hawleytoolcollection.com. And if you have any spare tools, they might fill a gap in the collection. This entry was posted in Sheffield's Heritage on February 10, 2018 by Mike Higginbottom. When I took my friends John and Lynn for a post-prandial walk in the park we came upon a deserted trench, surrounded by security fencing. We were intrigued to see brickwork exposed, and I surmised that it would have some connection with the bandstand that I knew stood on the park from the Edwardian period until it was demolished in the 1970s. Sure enough, when I saw activity a couple of days later and walked across to ask what was going on I discovered it was Dig it!, a project led by Dr Katherine Fennelly, Lecturer in Heritage at the University of Lincoln, and Colin Merrony from the Department of Archaeology at Sheffield, a happy combination of academic investigation and outreach to encourage local school and college students to take an interest in the fascination of archaeology and to think about taking the opportunity to study at university: https://www.sheffield.ac.uk/archaeology/news/digit_2017-1.714348. Teenagers are likely to take notice when they see young people a few years older than they are – in this case Sheffield University students Ceiridwen Blakesley and David Inglis – enjoying themselves with hands-on work that also requires serious thinking. By the end of the two-week dig the team had determined the dimensions of the octagonal bandstand from its remaining foundations, and had decided that the brick-lined compartment in the centre was a furniture store accessed by a trap-door in the wooden floor of the bandstand. The exercise will be all the more valuable if, sometime in the next five years, some kid from a north Sheffield school decides they want to train their mind and expand their career by going to university, whatever they choose to study. And I trust the Department of Archaeology will continue to Dig It! – after all, in archaeology as in show business, you’re only as good as your last dig. The Victorian Society South Yorkshire Group has a meeting that includes a talk by Kathy Clark of Historic England on Bandstands on Thursday November 23rd 2017 at 7.30pm at the Friends Meeting House, St James’ Street, Sheffield, S1 2EW. There is a charge of £5.00. This entry was posted in Life-enhancing experiences, Sheffield's Heritage, Victorian Architecture on October 20, 2017 by Mike Higginbottom.